Thermal breast imaging (Thermography) is a tool that measures heat from the surface of the body and allows us to visualize areas of inflammation and vascular activity that may signal increased risk for breast cancer. It does not directly detect or diagnose cancer but can help reach those goals. It is designed to be used as a complement to other breast examinations and not a replacement for mammography or any other diagnostic or screening examination. Unlike screening examinations or diagnostic examinations, the findings can suggest risk for currently having breast cancer or for developing it in the future. This information can be used to help determine when additional testing or intervention designed to lower risk is necessary. By watching for changes from examination to examination, Thermal Imaging can also help monitor the effects of interventions to see if they are effective. Interventions include things such as modifying one’s diet or lifestyle, improving nutrition or supervised care by a health care provider among others. The analysis is based upon deviations from the normal symmetry of the breast temperature. Temperature Patterns and Temperature Differences Between Breasts – The temperature is analyzed by looking at the patterns of warming and cooling (called notable temperature patterns) as well as the side to side differences between breasts. The actual breast temperature is seldom a factor. Once identified, temperature patterns and temperature differences are evaluated to determine if they are significant enough to contribute to your risk rating based on the Thermobiological (TH) rating scale as taught by William Hobbins, MD. Findings that are considered significant along with findings that are being watched for change are recorded in your report. Mastectomy– In the case of mastectomy, the ability to compare from side to side is lost. This is true even when reconstruction has been performed. 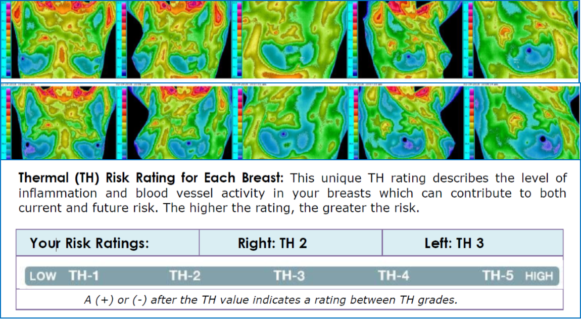 The remaining breast and mastectomy region are analyzed based up temperature patterns only and the mastectomy region is rated simply as low/medium/high risk rather than the standard TH scale. Radiation – When radiation therapy for cancer is performed to the breast, it frequently warms the breast for a period of years subsequent to completing the course of treatment. Consequently, the untreated breast may be analyzed based on temperature pattern only. The irradiated breast is evaluated normally with the understanding that the radiation warming may be simulating signs of inflammation. The breast is then monitored for stability and eventual resolution as the effects of the radiation diminish. Based upon temperature analysis only, this rating suggests a low risk that breast cancer may be currently present or that it may develop in the future. Since thermal imaging has been cleared as an adjunctive procedure only, this rating cannot guarantee that the breasts are cancer free and should not delay any other breast examination recommended by your doctor. It should not delay evaluation of any lump, skin change, clinical finding, and radiographic finding that may currently be present. When cancer is present, it tends to be growing less quickly (less active) or has not produced enough inflammation or changes to the blood supply so that it is visible on thermal imaging. The difference in risk between TH1 and TH2 is minimal. Follow-up thermal imaging for women over 30 years of age should be performed annually and, for women 20 to 30 years of age, every 3 years. Thermal imaging should be performed in addition to whatever testing and/or examinations are recommended by your doctor for screening or follow-up of an existing concern. Based upon temperature analysis only, this rating suggests a medium risk that breast cancer may be currently present or that it may develop in the future. Follow-up thermal imaging and other breast examinations such as mammography, breast ultrasound, and breast MRI can help clarify any significance to this rating. When cancer is present it may be more active and growing slightly faster than those found in the lower TH risk categories. This rating can also be caused by conditions such as normal variation in anatomy, some benign tumors, lymphatic activity or congestion and low grade inflammation or infection. It is important to determine the cause of the thermal findings and not prematurely conclude that cancer is present. 3-6 month follow-up thermal imaging is recommended depending on your individual situation. Additional imaging such as mammogram or ultrasound should be performed if it has not taken place within the last year. Your doctor will recommend the best test for you. If something is being watched on another examination such as a mammogram, you should consult with your doctor to determine if any additional testing is necessary at this time. Interventions intended to reduce risk can be considered as a preventative measure. This rating suggests a high risk that breast cancer is currently present or that it may develop in the future. Since this rating can also be caused by inflammation, infection and some fast growing benign tumors, it is important to determine the cause of the thermal findings and not prematurely conclude that cancer is present. Other factors such as lymphatic congestion and/or hormone imbalance can contribute to these findings and need to be considered when evaluating their significance. Most women with TH4 ratings do not have cancer at the time of the thermal imaging examination but do indicate high risk for developing cancer in the future. It is strongly recommended that you consult with your physician and begin additional imaging such as mammography, ultrasound, or any other appropriate test promptly to help clarify the thermal findings. A biopsy may be recommended if this rating occurs in a breast with a lump or other suspicious finding on another examination. Interventions intended to reduce risk are strongly recommended as a preventative measure. Follow-up thermal imaging should be performed at 3-month or at the discretion of the Thermologist based upon the thermal findings and any intervention being performed. A plus or minus sign is used to upgrade or downgrade the severity within a particular TH rating.